Paul Greer is a Professor in Health and Exercise Science at San Diego City College and has a Master’s Degree in Exercise Science and 32 years coaching experience. A top San Diego section miler at St. Augustine High School, Paul was inducted into the school’s Hall of Fame in 1995. After high school he went on to become the school record holder for 1500 meters at San Diego State. His 3:42.44 still stands as the best mark in school history. Greer also ran the mile in under four minutes (3:59.79), and has a personal best at 1500 meters with a 3:39.05. For many years, he competed on the tough European track circuit as a post collegian. In addition to teaching at San Diego City, Mr. Greer also coaches for the San Diego Track Club; the largest running club in San Diego. He works with over 500 runners at a time and is the Director for the Rockin N Runnin marathon/half marathon training program preparing athletes every year for San Diego’s Rock N Roll marathon/half marathon in June. 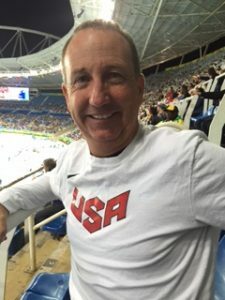 Over the past 32 years he has coached over 10,000 runners and recently was selected to be the Men’s Coach for Team USA’s Senior (20-35) and Junior’s teams (19 and under) at the Great Edinburgh Cross Country Championships. Currently, Mr. Greer is Secretary for the San Diego Olympians/Para-Olympians Chapter.